Looking for something different for the centrepiece for your Christmas table this year? Some of our traders from the 2016 food festival have got some mouthwatering ideas. How about a delicious Christmas pheasant with cider sauce and game chips as suggested by Natural Game? This Staffordshire company stock a range of British Game, poultry and exotic meats from estates across the north and midlands. Their online shop is still open so get in quick! Or what about Spiced Braised Venison with Chilli and Chocolate with venison from Round Green Farm. This farm near Barnsley has been the home of deer since the 1970s, and now sell through their farmshop and online. If you’d prefer the traditional bird, Whirlow Hall Farm have some fantastic Christmas offers on both poultry and Christmas trees, (though obviously we wouldn’t recommend putting those on your table!). Many of their turkeys are raised at the farm itself, making them the ultimate ‘local bird’! 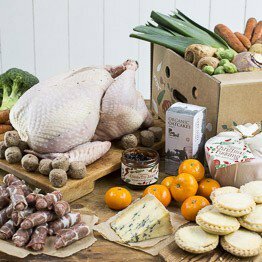 And for the ultimate in indulgence, if you’d really like someone else to do all the thinking for you, you could get a Christmas Dinner Box with turkey and trimmings, delivered to your door by Riverford Organics. It contains everything you need for the day itself, all the way down to cranberry sauce, mince pies, and Cropwell Bishop stilton.